Another outstanding release from Retrospect Records, which despite primarily being an 80s rock/metal reissue label, are proving themselves when it comes to new material as well (see Wildstreet). 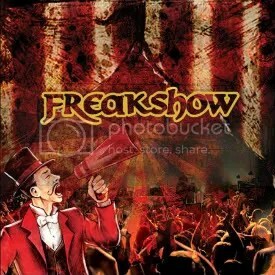 Freakshow is a supergroup of sorts featuring M!SS CRAZY’s Marcus Allen Christopher, Cinderella’s Jeff LaBar, Quiet Riot’s Frankie Banali. Rounding out the group is Tony Franklin, who is no stranger to supergroups, having played in The Firm, a collaboration between Paul Rodgers and Jimmy Page. He also has been in Blue Murder, Whitesnake and played on Rehab, the final Quiet Riot album. Given the band members, the sound of Freakshow is not what I expected. I was expecting a more classic rock/80s rock vibe and that sound is not entirely present here. In fact, the album very much has a fresh hard rock sound, just check out the incredibly infectious, mean and Zeppelinesque “It’s Really Over”. In a world that was fair and just, that song would be all over radio right now. On the surface, the band looks like a bit of a mismatch. Marcus Allen Christopher sticks out like a sore thumb with his face paint that makes him look like he belongs in a Norwegian black metal band, but all that really counts is the music and the music is great. I also love his voice, which can really wail and sometimes reminds me of Robert Plant. Hopefully, this isn’t just a one-off project of Christopher’s (he wrote all the songs), because this is one of the year’s best releases and I look forward to more Freakshow albums in the future.